Hippea maritima (Miroshnichenko et al. 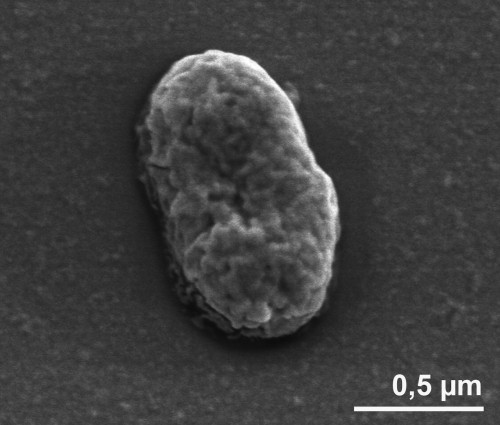 1999) is the type species of the genus Hippea, which belongs to the family Desulfurellaceae within the class Deltaproteobacteria. The anaerobic, moderately thermophilic marine sulfur-reducer was first isolated from shallow-water hot vents in Matipur Harbor, Papua New Guinea. H. maritima was of interest for genome sequencing because of its isolated phylogenetic location, as a distant next neighbor of the genus Desulfurella. Strain MH2T is the first type strain from the order Desulfurellales with a completely sequenced genome. The 1,694,430 bp long linear genome with its 1,723 protein-coding and 57 RNA genes consists of one circular chromosome and is a part of the Genomic Encyclopedia of Bacteria and Archaea project. A representative genomic 16S rRNA sequence of strain MH2T was compared using NCBI BLAST under default settings (e.g., considering only the high-scoring segment pairs (HSPs) from the best 250 hits) with the most recent release of the Greengenes database  and the relative frequencies, of taxa and keywords (reduced to their stem ) were determined, weighted by BLAST scores. The most frequently occurring genera were Desulfurella (38.7%), Desulfovibrio (15.2%), Deferribacter (10.8%), Thermotoga (10.8%) and Hippea (8.6%) (44 hits in total). Regarding the single hit to sequences from members of the species, the average identity within HSPs was 99.9%, whereas the average coverage by HSPs was 82.7%. Among all other species, the one yielding the highest score was Desulfurella multipotens, which corresponded to an identity of 89.6% and an HSP coverage of 82.6%. (Note that the Greengenes database uses the INSDC (= EMBL/NCBI/DDBJ) annotation, which is not an authoritative source for nomenclature or classification.) The highest-scoring environmental sequence was AF232926 ('United Kingdom: Montserrat geothermal springs clone MS10 proteobacterium'), which showed an identity of 88.9% and a HSP coverage of 73.0%. The most frequently occurring keywords within the labels of environmental samples which yielded hits were 'microbi' (5.0%), 'spring' (2.9%), 'sediment' (2.4%), 'soil' (2.3%) and 'industri' (2.2%) (206 hits in total). Environmental samples which yielded hits of a higher score than the highest scoring species were not found. 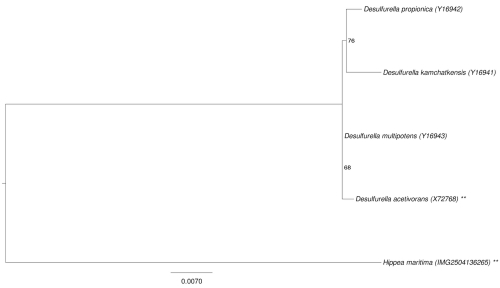 Phylogenetic tree highlighting the position of H. maritima relative to the other type strains within the family Desulfurellaceae. The tree was inferred from 1,526 aligned characters [5,6] of the 16S rRNA gene sequence under the maximum likelihood criterion  and rooted in accordance to the current taxonomy. The branches are scaled in terms of the expected number of substitutions per site. Numbers next to bifurcations are support values from 700 bootstrap replicates  if larger than 60%. Lineages with type strain genome sequencing projects registered in GOLD  are shown with an asterisk, those also listed as 'Complete and Published' with two asterisks. The cells of H. maritima are short rods ranging from 1-3 x 0.4–0.8 µm (Figure 2 and Table 1) that occur singly or in pairs . H. maritima is motile by one polar flagellum  (not visible in Figure 2). Colonies are whitish-gray with diameters up to 0.5 mm . H. maritima cultures require 2.5-3% NaCl and 0.02% (w/v) yeast extract for growth . The temperature range for growth is between 40°C and 65°C, with an optimum at 52–54°C . Growth was observed over a pH range of 5.7 to 6.5 with an optimum around 6.0 . Classification and general features of H. maritima MH2T according to the MIGS recommendations . H. maritima MH2T, DSM 10411, was grown anaerobically in medium 554 (HIPPEA medium)  at 55°C. DNA was isolated from 0.5-1 g of cell paste using Jetflex Genomic DNA Purification Kit (GENOMED 600100) following the standard protocol as recommended by the manufacturer with the following modification to improve cell lysis: additional 20µl lysozyme (100mg/µl) and 10µl mutalysin were used for 30 min incubation at 37°C, followed by three hours incubation at 58°C with 20µl proteinase K. DNA is available through the DNA Bank Network . Kuever J, Rainey FA, Widdel F. Family I. Desulfurellaceae fam. nov. In: Brenner DJ, Krieg NR, Staley JT Garrity GM (eds), Bergey's Manual of Systematic Bacteriology, second edition, vol. 2 (The Proteobacteria), part C (The Alpha-, Beta-, Delta-, and Epsilonproteobacteria), Springer, New York, 2005, p. 923. Han C, Chain P. Finishing repeat regions automatically with Dupfinisher. in Proceeding of the 2006 international conference on bioinformatics & computational biology. Arabnia HR, Valafar H (eds), CSREA Press. June 26-29, 2006: 141-146.